A father tucks his heavy-eyed son into bed. He kisses him on his forehead and blesses him a nightmare-free night. As he turns away the son tugs at his shirt, enquiring for a bedtime story. The sheepish father racks his brain for a suitable parable. Epiphany arrived, he places himself on the edge of his son’s bed and utters, “Son, this is a familiar narrative of ‘The Dismal Gunners’”. It all began on a wet, morose night in north London, where the Emirates stadium hosted Arsenal’s biggest game of the season, thus far. It was the first leg of the last 16 in the Champions League; a leviathan hurdle that has begrudged Arsenal for many years, but this time it would be different. At this stage of the competition Arsenal had repeatedly shot themselves in the foot, but yet this time it would be different. At this very same stage Arsenal had been the proverbial magnet towards the bigger teams. But this time it would be different. This time, AS Monaco were the magnet for the bigger teams. The hurdle seemed approachable at first viewing, but was this a mirage? A ruse? The clip in the gun was emptied, so surely there would be no the foot casualties? On a wet night at the Emirates Stadium, Arsenal had committed the mother-of–all-Rabbit-from-8-mile screw-ups. 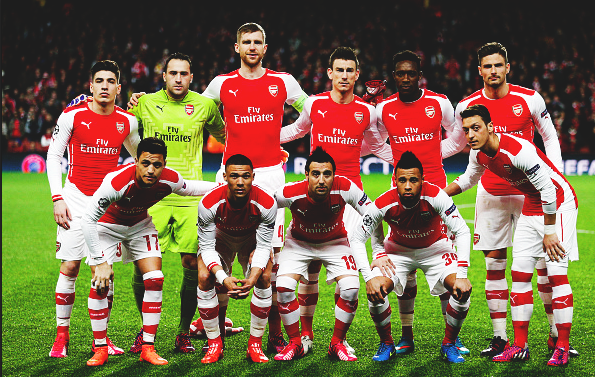 A cowardly performance had befallen onto Arsenal, as they lost a crucial home leg tie, 3-1. Making their second leg trip away at Monaco almost perilously unachievable. The fatal ingredients of premature cockiness, coupled with a tepid performance conjured up a bitter humble pie. All of Arsenal’s flaws of the past came back to add the finishing touches to this humbling pie, and on such an important night. Monaco, 4th in the Ligue 1 provided a quintessential Champions League away performance, portraying such a cerebral display, whereas their unstable counterparts, victims of their own sacrilege, showed naivety and suicidal tendencies. A dumbfounded Arsenal had no answer for Monaco’s double act, Joao Moutinho and Geoffrey Kondogbia, who displayed a performance full of clout, deserving of an encore. Arsenal demonstrated a familiar trick where they throw the kitchen sink at a time where there needn’t be any throwing, and this was evident for Monaco’s second goal. The Arsenal back four can be very proud of their performance, if they worked as an air traffic controller. They were constant victims of prematurely diving in, leaving a runaway behind them for Monaco to take off. Usually when the Arsenal defence falls, the attacking units would somehow pick up the slack. That was not the case this time. The Monaco back four were untroubled for most of the night, even though Arsenal pulled a goal back. The fact is, Arsenal came to the bout with blunt spears to bring down the formidable castle of Monaco, where Prince Albert II, Prince of Monaco (who was watching the game from the executive box) lived peacefully. Arsenal have provided us with another sequel in their movie franchise of their dismal Champions League escapades. “A five star comedic performance”, said the Observer. “You’ll literally run out of tears”, said the Daily Mail. The father closes the book and looks at face of peace and tranquility that is painted on his son’s face. He then whispers, “next time I’ll tell you what happens in the next leg. Goodnight son”.